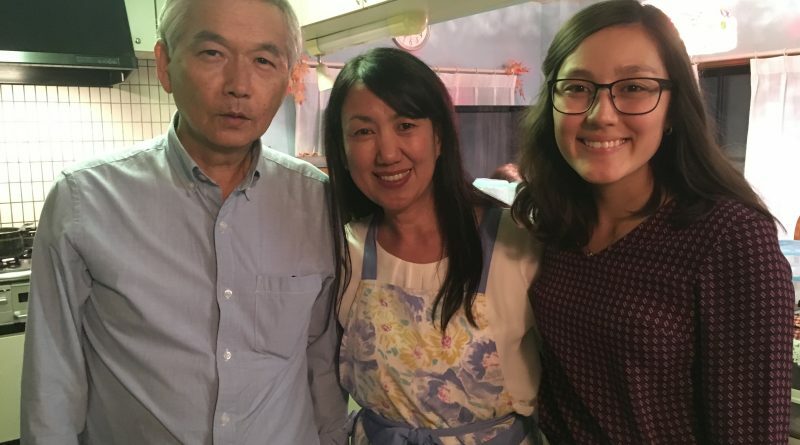 Hosting thirty-something JETs for Thanksgiving is something that Chisako Higashiya from Seki, Gifu, does with poise, generosity, and remarkable authenticity. All Gifu JETs are annually invited to attend this AJET-organized event — just bring five-hundred yen and a dish to contribute. The allure of a home-cooked feast draws JETs regardless of whether they know Chisako or celebrate Thanksgiving. For those who do celebrate it, the menu itself, posted online beforehand, promises to be a remedy for any creeping homesickness related to the holiday: garlic mashed potatoes, gravy, cranberry sauce, several kinds of stuffing, not one but two turkeys, and, with a twist on a classic, pumpkin cheesecake. It was a case of homesickness, in fact, that motivated Chisako to annually welcome JETs into her home for Thanksgiving for the first time about fifteen years ago. Having befriended an American JET at a community swimming pool, come November she found herself hosting a dinner party with his friends, celebrating a holiday as foreign to her as the language they were speaking. She admits to feeling panicked. “I was not comfortable around many English speakers, so I just wanted to run away,” she recalls, laughing. At the end of the evening, however, they sincerely thanked Chisako, and one girl who was experiencing homesickness approached Chisako. “She said she got over it because she came to my Thanksgiving party,” Chisako says. [S]tarry-eyed first-year JETs have to come to terms with how their idealized image of Japan compares to the reality. As Chisako mentions the word homesickness, I look around the room, wondering who is struggling now to feel at home in a foreign country. Actually, I overheard one JET, a recent arrival like myself, candidly tell the person next to her that at first she had a hard time adjusting to life in Japan. If she had not said something, though, I would have assumed she was as well-adjusted as she appeared. Speaking from experience, Chisako wisely notes that it’s possible to seem happy to others when the opposite may be true. Having had many JET friends, as she calls them, Chisako also has insight into our particular plight and acknowledges that “living in Japan is not all the time good.” Although this can be said of all places in the world, starry-eyed first-year JETs have to come to terms with how their idealized image of Japan compares to the reality. When we thank Chisako, she returns the words, saying, “I would like to say thank you to everyone too. I got over [my own] hard time because I have, all the time, JET people.” It’s true that it is difficult to imagine Chisako having a hard time. She is cheerful, her cheeks rounded with a near-constant smile even as she talks, and her eyes have a brightness to them that reflects her happiness in the moment. A clean floral apron is tied around her waist and her long hair is held back with a headband. She seems perfectly at ease, especially now that, from sheer exposure, she understands the English around her. Even when preparing food for such a large group, Chisako feels no stress, as she is now able to cook an entire Thanksgiving meal by herself. She follows a methodical cooking plan four days up to the event and even uses her own recipes. My JET friends are special. Very special, like special family. A good way to keep in touch with Chisako is to take one of her workshops on how to make Japanese paper dolls. They run once a week, and another first-year JET and I agreed to come back to Chisako’s house for one. Instinctually, we wanted to return, and not to our home countries, as we might have been feeling prior to this Thanksgiving event. Rather, we wanted to return to Chisako’s, which Chisako herself refers to as the “JET people’s home.” Miraculously, I felt this sense of attachment from the moment I walked in. I experienced, and later saw, Chisako greet strangers as friends and friends as family, without hesitating to offer an affectionate embrace. There is a sense that, once you step into her genkan, which had been cleared to accommodate the shoes of her guests, you are immediately and unconditionally one of those friends and a part of that family.